The anticipation has continued to build for the 20-year-old, who finished second in the Quebec Major Junior Hockey League in scoring last season with 104 points (45 goals, 59 assists). Along the way, Abramov (5-foot-9, 171 pounds) moved from wing to center. "You have to be more responsible in the D zone. That's why I like to play center," he said. "Center has more of the puck, controls more pucks than the wingers, so he controls the play." Abramov, who was MVP of the QMJHL in 2016-17, when he had 104 points (46 goals, 58 assists) for Gatineau, will either play for the Blue Jackets or Cleveland in the American Hockey League. 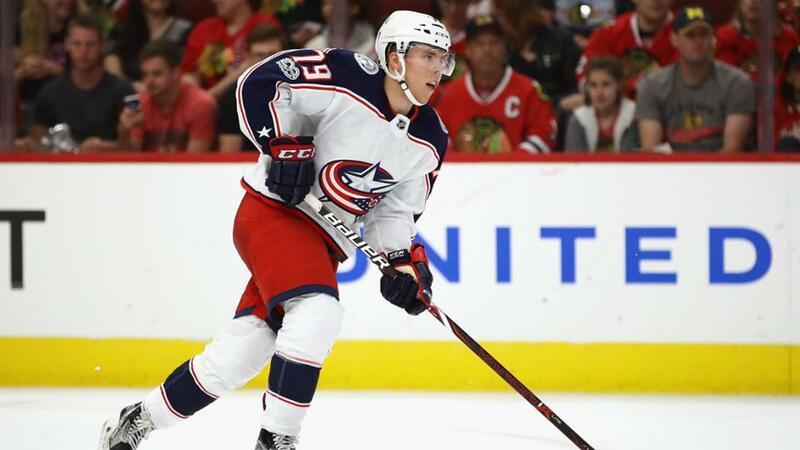 "If you earn a spot on the [NHL] roster, you then have to earn a spot in the lineup," Columbus general manager Jarmo Kekalainen said. "With all the young players, we want them to be in the lineup rather than in the press box eating popcorn." Foudy is a late bloomer, and it surprised many that he was drafted so high, but the 18-year-old has a lot of upside, particularly his acceleration. He had 29 points (18 goals, 11 assists) in his final 24 games last season after earning more ice time. Although he can outskate most of his peers, Foudy's finishing needs work if he's going to develop into an NHL regular. "I know I'm a first-round pick and there's a lot of attention on me," he said. "I try not to think about it too much." Foudy (6-0, 175) credits his early years of competing in track for helping him handle pressure. His mother, France Gareau, won a silver medal with Canada's 4x100-meter relay team at the 1984 Los Angeles Olympics. "In track, unless you're on a relay, it's just you out there," Foudy said. "You may be part of a team, but what you do in your event relies on what you do. There's no one there to help you when you're in the middle of competing." Davidsson, 21, caught the attention of the Blue Jackets with a solid season in the Swedish Hockey League. "I'm a speedy forward with a lot of pace," Davidsson said. "I'm a good passer. I want to score, score a lot of goals." Davidsson (5-11, 185) knows he needs better strength on the puck. "I want to improve that part and be able to handle the puck in small places, along the boards," he said. 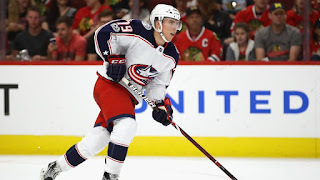 Gavrikov, 22, declined an offer to sign with the Blue Jackets a year ago and signed a two-year contract with St. Petersburg. He also played for the Olympic Athletes of Russia in the 2018 PyeongChang Olympics, when he had two goals and three points in six games to help them win gold. Though Gavrikov likely won't be an offensive threat, his size (6-3, 205) and mobility could make him a shutdown defenseman in the NHL if he decides to come to North America. The 24-year-old may never get a good look in Columbus if goalie Sergei Bobrovsky, who can become an unrestricted free agent July 1, signs a contract extension or re-signs next offseason. Merzlikins (6-3, 183), voted the top goaltender in Switzerland's National League last season, was 4-1-1 with a 1.50 goals-against average and .940 save percentage for Latvia at the 2018 IIHF World Championship. His contract with Lugano expires after this season.